The Leiopython Albertisii is a medium sized python. They are also known as Northern White-Lipped Python . 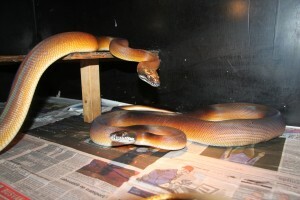 The Leiopython Albertisii is usually 180 to 220 cm in length. The White-lipped pythons are housed in cages build from shuttering plywood 125 cm long, 75 cm wide and 60 cm high. I use newspaper as a substrate. The White-lipped python is very sensitive to wet conditions or to low humidity. It’s very important to get a high humidity for a period of 3-4 hours. I try to peek this 2-3 times a week. White-lipped pythons are in general really good feeders. I feed my adult pythons once every two weeks a large prey item. Their strikes are very fast, so watch you fingers! Regulary they will through up fur balls. I keep my pythons a bit cooler during the breeding season. It’s started in October with less light hours and cooler night temperatures. In November i’ve got 6 hours the lights on and 18 hours the lights off. The day temperatures stays the same 30-35 degrees, but the night time temperatures will drops to 16 degrees celcius. End off Februari the temperatures and light times are back to normal. The first year i bred my pythons, they are kept seperate till November, but i’ve got some good breeding results by keeping the pythons the whole year together. Only during feeding i will keep my pythons seperate. Incubation on mixed moist vemeculite and perlite (1:1) at 30°C (+- 2°C). My neonates hatched between 60-70 days. There could be 10 days between the first hatchling and the last. The eggs are sticked together and placed into the incubator without removing the eggs from each other. Birth weight between 30 gsm and 40 gsm. Also the white-lipped python neonates are in general really good feeders and feed after their first shed. I housed the neonates in small shoe boxes with a heating mat. The temerature between 28-30 degrees celcius, 24 hours a day and 7 days a week.